The Memorial is designed to commemorate the patriotism of Japanese Americans during World War II. Its design is a response to a dark chapter in our nation’s history when war hysteria and prejudice led to the incarceration of 120,000 Japanese Americans. Many were American citizens by birthright and despite the egregious injustice done to them by their own country, they still felt compelled by a sense of loyalty and duty to fight for our country. When he signed the Civil Liberties Act in 1988, President Ronald W. Reagan stated, “Here we admit a wrong. Here we affirm our commitment to equal justice under the law.” This statement, meant as an apology to all those who suffered civil liberties injustices, is a key part of the ideological fabric of the National Japanese American Memorial to Patriotism during World War II. Located on a triangular urban site adjacent to the U.S. Capitol, the design of the memorial elegantly responds to the surrounding streetscape. Sensitive landscaping enclosing the memorial creates a space of solitude for an optimal experience. The simple spiral plan juxtaposes the harsh geometry of the site and creates an architectural experience of confinement and release. Dimensional granite with the inscribed names of those Japanese Americans who died while fighting in World War II envelopes the space and a still pool of water encourages visitors to pause for a moment of self-reflection. The pool is illuminated at night with energy efficient fiber optic lights transforming the memorial. “The Golden Cranes” sculpted by Nina Akamu, a third generation Japanese American, majestically stands at the center of the space. A program combining water elements, wall inscription, statue, and landscape are designed sensitively and work brilliantly together to create a moving, yet informative, monument. 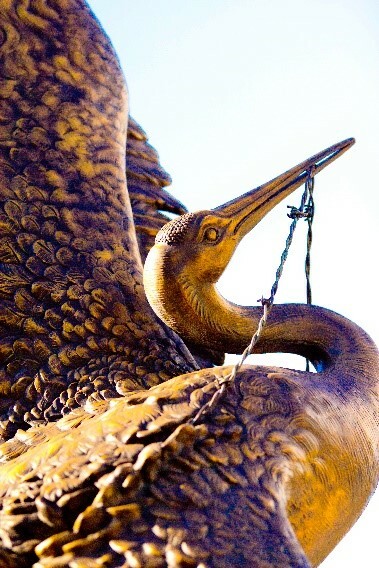 With a height of 14 feet, the upper portions of the crane sculpture are visible above the confines of the Memorial wall, symbolic of rising beyond restrictions to freedom. The base of the sculpture is rough cut from green Vermont marble which has a beautiful serpentine texture. The identical position of the bronze cranes represents the duality of the universe. Their bodies are nestled side-by-side with their free wings pressed against each other, symbolizing both individual effort and communal support, emphasizing interdependency. Their right wings are held flush to the sides of the base by an incuse strand of barbed wire. The birds have grasped the wire in their beaks in an attempt to break free. The sculpture is symbolic not only of the Japanese American experience, but of the extrication of anyone from deeply painful and restrictive circumstances. It reminds us of the battles we've fought to overcome our ignorance and prejudice and the meaning of an integrated culture, once pained and torn, now healed and unified. Finally, the monument presents the Japanese American experience as a symbol for all peoples. The Memorial honors those members of the 100th Battalion, the 442nd Regimental Combat Team, the Military Intelligence Service and other units who fought with conspicuous bravery. The names of those who made the ultimate sacrifice are engraved on several of the panels. In addition, the Memorial honors those who experienced dislocation and were held in the War Relocation Authority concentration camps during the period 1942-1945. The discrepancy between the total number of incarcerees in the 10 camps listed (117,556--WRA figures) and the figure of 120,000 engraved on the monument wall is because the population of the individual camps changed almost daily as individuals died and babies were born, as individuals were shifted among camps or released to help with local harvests, etc. Several panels are devoted to important quotations on the importance of the Japanese American struggle for equality and redress. Some serve as a reminder of dark days which must never be repeated. The reflecting pool opposite the wall of panels contains five huge boulders representing the generations of Japanese Americans affected by the WWII confinement. The stones are made of Minnesota granite. They provide the stability within a flowing pool of water, recalling the past as one meditates on the future. The resounding bell was designed by Paul Matisse to provide an opportunity for visitors to interact with the Memorial by making a deep and somber tone, expressing closure on the conflicting difficulties and tragedies of the events described. The Memorial is part of the National Park Service's National Mall and Memorial Parks division. They are responsible for the upkeep and maintenance of the site.